Employing a body load to produce a basket of flowers, bowl of water, or some other large item from a foulard is a centuries old concept. 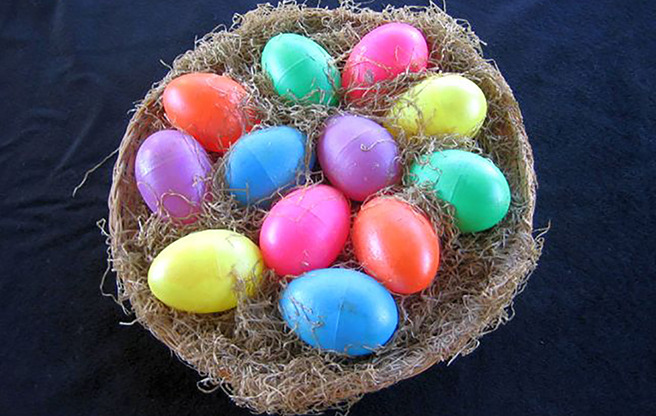 Producing a full Easter basket makes for an impressive and colorful finish for a seasonal show. The modus operandi is exactly that taught by Professor Hoffmann, and is based on a method used by the great Robert-Houdin. It is adapted here for Easter egg magic. EFFECT: The performer picks up a foulard, which he spreads and shows on both sides. It is as innocent as it appears. Instantly, he whisks the foulard away with one hand and displays an Easter basket resting on the other.